William A. 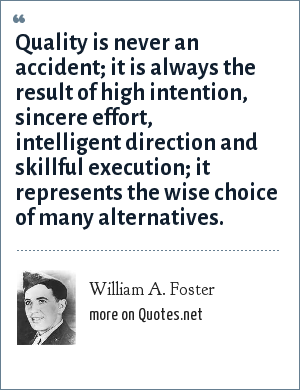 Foster: Quality is never an accident; it is always the result of high intention, sincere effort, intelligent direction and skillful execution; it represents the wise choice of many alternatives. William Adelbert Foster was a United States Marine who received the Medal of Honor for his "conspicuous gallantry and intrepidity at the risk of his life above and beyond the call of duty" during World War II during the Battle of Okinawa in 1945. Qualität ist niemals ein Zufall; es ist immer das Ergebnis von hoher Absicht, aufrichtiger Anstrengung, intelligenter Ausrichtung und geschickter Ausführung; Es ist die kluge Wahl vieler Alternativen. la qualité n'est jamais un accident; c'est toujours le résultat d'une intention élevée, d'un effort sincère, d'une direction intelligente et d'une exécution habile; il représente le choix judicieux de nombreuses alternatives. kualitas tidak pernah merupakan kecelakaan; selalu merupakan hasil dari niat tinggi, upaya tulus, arahan cerdas dan eksekusi yang terampil; itu mewakili pilihan bijak dari banyak alternatif. la qualità non è mai un incidente; è sempre il risultato di alta intenzione, sforzo sincero, direzione intelligente e esecuzione abile; rappresenta la scelta saggia di molte alternative. "William A. Foster Quotes." Quotes.net. STANDS4 LLC, 2019. Web. 18 Apr. 2019. <https://www.quotes.net/quote/44042>.